The Kerstein bed is both fashionable and comfortable. 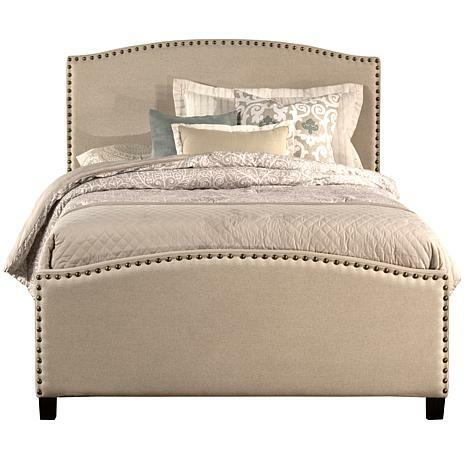 An impressive slightly arched headboard and footboard are complimented by nail-head trim. The fabric covered side rails and footboard continue the soft, luxurious theme and the nail-head trim. Constructed of solid pine and plywood. Available in your choice of three colors, the Kerstein bed is a fantastic addition to any home. Fabric Color Choices: Dove Gray, Navy Linen, and Light Taupe. Includes: headboard, footboard, rails, and slats. Assembly required. Constructed of plywood, pine wood and fabric. Indoor use only. Dust with a clean, dry cloth. Warranty of one year. Country of origin: China.